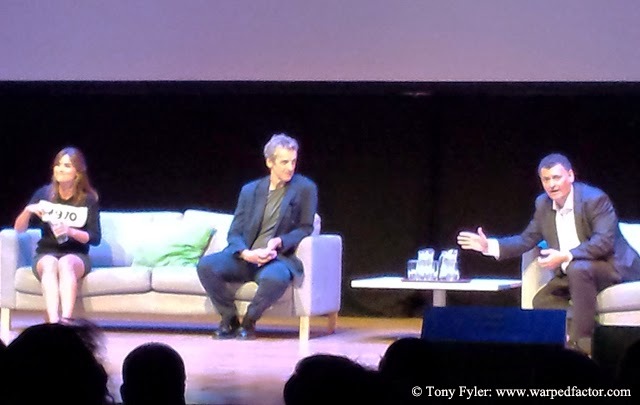 DOCTOR WHO - Cardiff Q&A with CAPALDI, COLEMAN and MOFFAT | Warped Factor - Words in the Key of Geek. 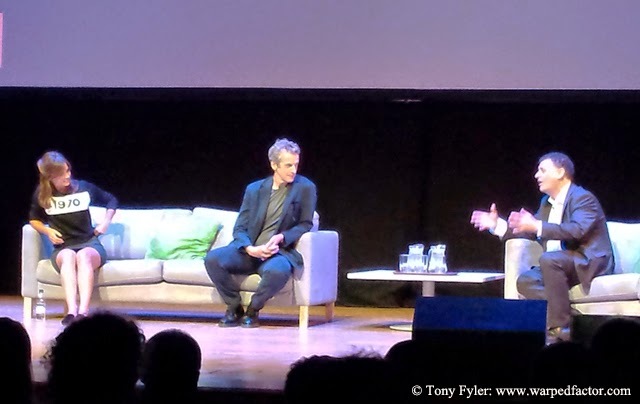 Tony Fyler attended the Doctor Who Cardiff premiere of Deep Breath yesterday, which also included a Q&A session with Peter Capaldi, Jenna Coleman and Steven Moffat. Find out about Series 8, the Doctor's new outfit, new monsters, Sherlock-Who crossover and Peter Capaldi's sulky face. Q: There were four and a half thousand people on the streets outside St David’s Hall today. How does that make you feel? Moffat: Pressured! And amazing. When the show came back, Russell said we might get ten years out of this. Nobody thought that ten years down the line, we’d still be getting bigger and better and stronger. Q: What was it like stepping onto the set for the first time? Capaldi: Terrifying and rather wonderful. I’ve always loved Doctor Who, but I hadn’t spent my life mourning the fact that I’d never play the Doctor – but then I was. There’s also a sense of responsibility, because people really love it, but really I felt it doesn’t get better than this. That’s why the show’s so successful – people who really love it. Particularly when it gets this big, that can be swept away. But keeping that flame alive are the people who make it and the people who love it. Q: What can we expect from Series 8, going forward? Moffat: Daleks. There’s some scary stuff coming up. Robot knights, which I’ve always thought was the only thing missing from the Robin Hood stories. We’ve got a thing called a Teller, which is absolutely grotesque. Oh there are some belters coming up. Capaldi: There’s a fabulous monster that we’re not even sure is there. Q: When it came back, did you always know it was going to be so successful? Moffat: Yes, absolutely. Russell’s first script was perfect, it was exactly what it had to be. So I – having the luxury of just writing a two-parter, never had any doubts it would be the best thing on television. I said ‘Nothing to worry about, this is going to be the best thing on television’. Russell and the team just looked grey and old and knackered…in the way that I now look grey and old and knackered. But yes, I said it was going to be the biggest show on TV. Nobody imagined it would stay that way. Capaldi: I’m not sure it’s always been a family show, but it’s become an institution again. Q: On the Doctor’s new outfit, did you have strong ideas, or was it something that was decided for you? Capaldi: I always just thought of the Doctor in dark colours. I dunno, maybe that was because I grew up watching it in black and white. I’ll try anything, but in the back of my head, there were always dark colours. We went round, from velvet jackets to scarves, to floppy hats. People seemed to want the floppy hats. But it comes down to the fact that one day, you try on a bunch of stuff that makes you feel like the Doctor. This worked for me. Plus, I wanted something that the fans could emulate without going to a lot of expense. Moffat: This is sort of where we started out, and then we went round in this big circle and came back round to it. I’d be getting emails with series of pictures of Peter in different outfits – something I’d never expected to have, to be fair. And I don’t know if you’ve noticed this, but Peter’s got a great sulky face. So you could tell which series of outfits Peter didn’t like cos the face would be all sulky. And then you could tell which series of outfits he did like, because suddenly in the pictures, he’d be pulling Doctor poses, pointing at things. Q: Does your Doctor ruminate about his past, like other recent Doctors, or would he rather ride a T-Rex? Capaldi: He gets on with adventures and challenges. Anyone who’s lived the Doctor’s life, he’s always going to be haunted and challenged, but he gets on with things. Q: It’s the tenth anniversary of New Who coming up. Any plans? Moffat (looking appalled): We’ve just done the fiftieth! I think it’s time to settle down and aim forward, so we’re not planning a tenth anniversary celebration…unless I’m lying. Q: How many lives does the Doctor have? Moffat (buries head in hands): 26. Q: Did any specific actors inspire your take on the Doctor? Capaldi: No specific ones, but you know people have started asking me that and I’ve started thinking about it. I was brought up on Doctor Who, so really William Hartnell, Patrick Troughton, Jon Pertwee, Tom Baker, Peter Davison and all the others, but especially the first four. They taught me how to act. When I was new in the business, I was probably channeling those actors, and people like the incredible Peter Cushing, and all those fantasy and horror actors who don’t get the credit they deserve. Only now have I realised how hard it is to act as if a monster is terrifying. Q: Will there ever be a Sherlock/Who crossover? Even for Comic Relief? Moffat: I would, but go talk to Cumberbatch and Freeman and Gatiss and Vertue, they’re the ones stopping it. It probably won’t happen. I suspect, as Mark said to me, that it would be a lot less fun on screen than it would be in your head. The two arch-geniuses in a room? They’d just go off into separate corners and sulk that somebody else clever was there. Q: Is there any Malcolm Tucker in your Doctor? Capaldi: There’s a certain acid wit he might show. Obviously no bad language. I think Malcolm would be incredibly envious that his alter ego (me) had got this gig. But yes, there’s a little. It’s not misplaced in a show like Doctor Who. Q: What themes are there in Series 8 that reflect the modern world? Capaldi: Ego, morality, and whether that morality is an accurate reflection of the soul. Q: So is it more Classic Who than New Who? Capaldi: The show’s changed since I grew up, and you have to accept that. There’s a deeper well of love in it now than in the old days, where it was only touched upon, say when the first Doctor left Susan behind. The Doctor’s crazy about Clara, he loves her in a very deep way that’s not just about romance. Q: If you could travel back to any historical era, which would it be? Capaldi (tongue in cheek): Ancient Rome. Q: What were your favourite bits of this first episode? Capaldi: When Clara comes on board the Tardis, and the Doctor’s himself, and he tries to get the essence of ‘them’ back. Q: How have Capaldi stories changed from Smith stories? Moffat: There’s a different Doctor in a different phase of his life driving the show. You’ve seen some of that in Episode 1, and there’s more in Episode 2, when we unveil our secret weapon. That secret weapon is Sam Anderson as Danny Pink. Nothing will ever be the same again. Q: How about a Paternoster Gang spin-off? Moffat: We’re raising the money – if you’d like to chip in…? Honest answer, who knows? Q: So, you’re bringing back the Cybermen. How about an origin story? Moffat: There was one written, but it never got to film [We assume he’s referring to the Gerry Davies-scripted story explored in some detail in the recent DWM Cybermen Special]. Capaldi (agitating in favour): Sounds good to me! Q: If you could travel back in time and tell yourself from years ago that one day you’d be the Doctor, what would you tell yourself? Capaldi: I’d say ‘Don’t listen to what anyone says. You’re good. Put your anorak on. Keep drawing. And keep writing to the BBC.